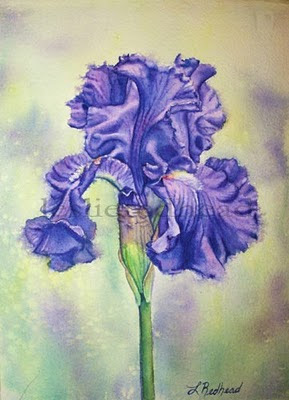 This is a little something I did over the weekend - another iris painting to show at the American Iris Convention. On the home front, my daughter will finally start school tomorrow! It has been a challenge getting her into the school system here in Vancouver. She will only be going part time and will be home schooled part time as well. This is because she came from a sememster based school to a year round school. The home schooling is to get her caught up in the important courses. She is very self motivated and will probably have it all completed by the end of March! I am preparing for my workshops in Victoria next month. I will be teaching a pouring watercolor course on March 22-23 and portraits on March 26-27. Please contact the Coast Collective Art Centre to sign up. 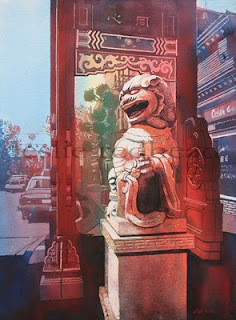 Fellow watercolor artist and friend, Christiane Kingsley, was kind enough to feature my work on artalee.com. It made my day to discover that she did that for me! Especially since it has been a hard week missing all the friends I made through teaching classes. I loved seeing my wonderful students at class every week! I hope that I will see them again when I return to do some workshops in March. I will also be substituting for one of the Thursday afternoon classesat that time. Yeah! To view more of Christiane's work, please visit her blog. To view the article on artalee, please click here. This week has been full of things to finish. 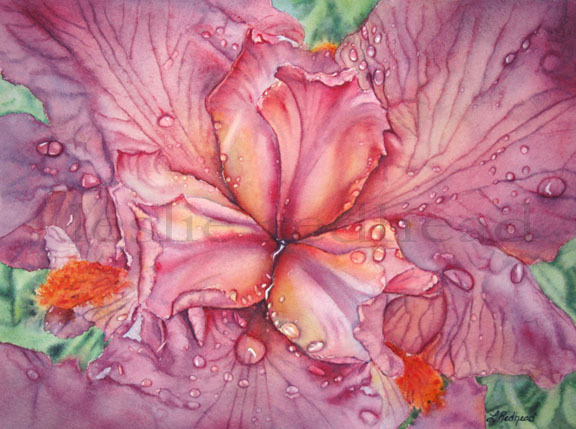 Finish getting the kids in school, finish setting up my studio, and finally finish the iris painting! It has been great to work on Center of the Universe since I have more time to work on detailed pieces. I was asked a few months ago if I would be interested in showing at the American Iris Convention being held at the Empress Hotel in Victoria. Of course I said yes! Irises are a personal favorite of mine because they remind me of my grandmother. She always had irises in her garden. 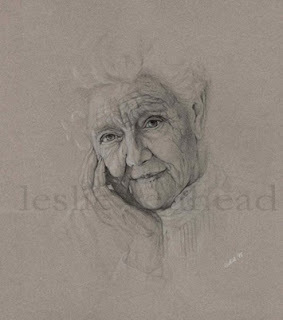 My grandmother lived with my parents shortly before she passed away. The spring following her passing, my parent's garden bloomed full of irises. There must have been hundreds. My grandmother probably knew she would not live much longer. She had planted all those irises, unbeknownest to anyone, to remind us that she will always be with us even after she was gone. Thank you Grandma for such a beautiful memory. We moved this past weekend into our new home in Vancouver. It was a crazy couple of weeks as I tried to finish commissions, teach classes, say goodbyes, and get the house packed and ready to move. Now we are here and I am excited to put my studio back together. At least I have more time on this side to do that. Since I no longer feel as rushed, I can get back to blogging and to being inspired by other's work. 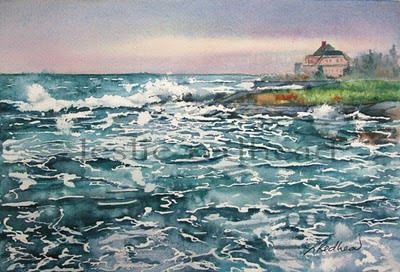 The above painting was the last one I did for my Thursday class on the Wet Coast. It is a scene from the Oak Bay Marina parking lot looking south. I took the photo while trying to stand in the wind and the rain. The sea was magnificent with all the crashing of waves. I was pleased that I captured the color of the ocean on that particular morning. It really was such a beautiful color.